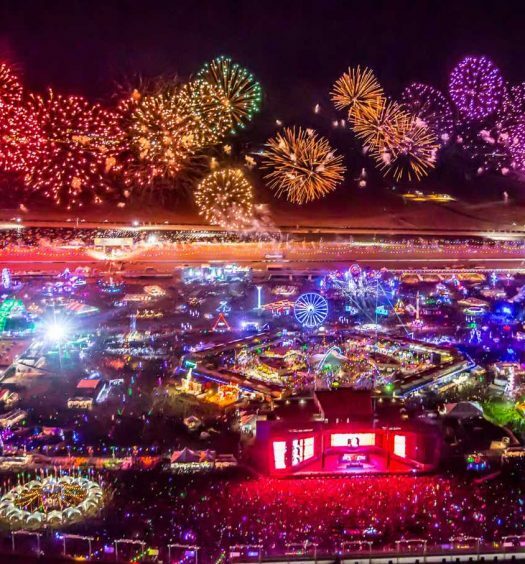 It was around eight o’clock at Moonrise Festival in Baltimore, Maryland when the news came that the festival would be back on. As a storm demanded that attendees be evacuated to the bleachers of the Pimlico Raceway, fans embraced the spontaneity of the situation. Some chanted anthems like “Seven Nation Army,” and “Kernkraft 400.” Some participated in a festival-wide performance of the wave. Some even raced along the track of the raceway, covered in mud. 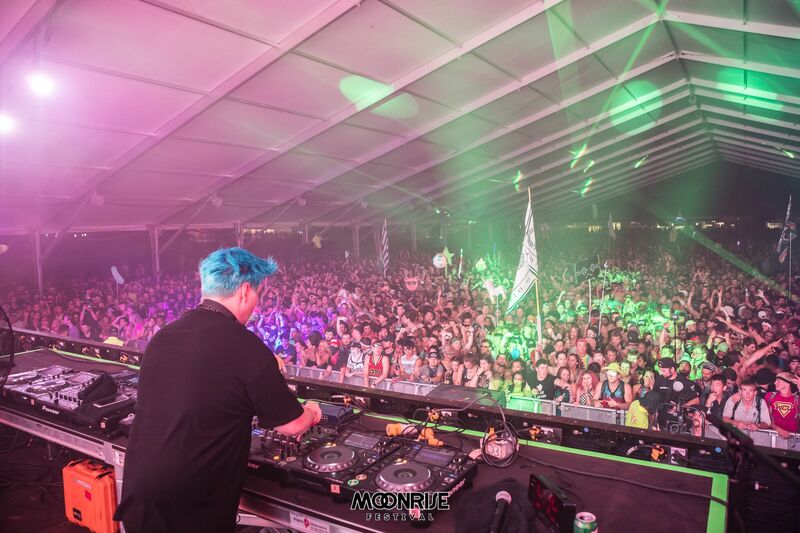 As the festival started back up, Flux Pavilion brought the energy back to the Solar Dance Tent. And what a return that was. The legend treated the Mid-Atlantic audience to a spectrum of all things Flux. 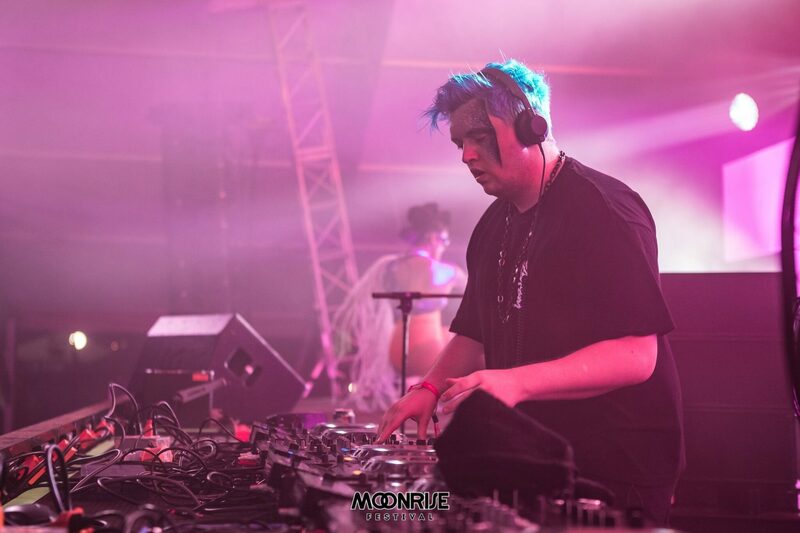 A performance of classics new and old, this experience with Flux Pavilion felt more like a journey than a DJ set. We met with the man/myth/legend just 30 minutes after the end of his set, where we talked about touring, Circus Records, the state of electronic music, and just about everything. I think it’s fair to say you’ve been a pretty busy guy over the past few years, how has the Around The World In 80 Raves Tour been treating you so far? Pretty good! I think today is show 63. We started in March, so we’ve pretty much been touring for six months. It’s going great, and there are no signs of slowing down. We’ve got the rest of the world to captivate, so we’re going full speed ahead. I’d say it’s probably good to be around the world in 150 raves. Might as well go for around the world in 800 Raves at this point, right? You know, I was thinking about it, and I think I’ve done over a thousand shows now. We’re either just closing in on it or around that number but yeah, it’s been quite a lot of traveling around, playing the music, and expressing Flux Pavilion as a sound. ‘Around The World in 80 Raves’ is kind of like a culmination of that and making sure that we go everywhere and make this music heard. There are quite a lot of people and quite a lot of communities that don’t really get to hear the music. Everyone is touring America all the time, everyone’s coming here, or everyone’s going to Europe. Only a few people go through places like South Africa, or India, and we’ve never been out there playing shows before. The energy is insane, the people love the music and connect with it on a level that I had never really expected. India feels quite far removed from England, but the connection between the music and the people is something that’s really beautiful. The tour is about that. It’s about not shying away from it and giving me a perfect excuse to go everywhere. We get to experience everywhere and share the music in all the places that we possibly can and I think that’s important. Having seen so much, what do you think the next big thing in electronic music is? I don’t know, really. I kind of don’t care, as well, I guess. I do my own music, I do my own thing, and I like to watch and enjoy what’s going on in the rest of the scene. I never really let anybody weigh what I want to do. Your style is your style, basically. It feels really pointless, if I were to try to follow exactly what’s going on. There’s no way I would be able to discover something new with my own music if I’m constantly trying to find out what everyone else is doing. In terms of what the next trend is going to be and what’s going to be popping, I don’t think that should be of much interest for me. As a fan of the music, that’s interesting for me, but as Flux Pavilion, I think it’s best to try to stay in my own world basically. It seems like there’s a lot of people rushing to enter the industry. Do you think the electronic music stage is too crowded or is there space for young talent? There’s always room for good music. I don’t think it matters whether a scene is over-crowded or under-crowded, I think good music rules in my eyes. All it takes is someone to come out with some good songs and they’re on top of their game. Look at someone like DJ Snake: he’s been around for a while doing his thing, but he catapulted to the top. My personal belief is that this isn’t because he played the game or knew the industry, but because he wrote some really great music. If you listen to the era of what Snake has been writing, it’s started with some really amazing music, and now he’s there at the top. I really think that’s how the game should be played, and that’s how I’ve always tried to view it. So the secret is the quality of the music? (Laughs) That shouldn’t be a secret, writing good music should be the relative norm for what an artist should be doing, essentially. But yeah, the idea of trying to get involved in a slice of EDM of is sort of… that scramble doesn’t really get you anywhere, good music will. Keep it real, basically. What would you say is the most pivotal point in your personal career? Probably getting sampled by Jay-Z and Kanye West. That was pretty insane. Things were going really well anyway, “I Can’t Stop” was doing it’s thing. I think for me personally, it helped to solidify what I was doing. It made it feel like what I was doing was actually real. I was just a kid sitting in my bedroom in a university, writing some songs. Part of the dubstep world is that there’s always stuff going on, and you’re always looking at the stars, being like “oh, I need a record deal, a big studio, and all this marketing to be that big. But with none of that at all, our music made it to their ears and they liked it and they used it. I didn’t take any steps towards trying to make that happen. I wasn’t marketing the f**k out of myself, I wasn’t on Instagram every single day, all I did was write some songs and put them out. So it kind of gave me an affirmation that I didn’t need to chase all of the dreams that I was led to believe on how to become a star or an artist. It’s like, literally, you can have some thoughts and write them down and you’re an artist. You don’t need anything else other than making stuff that you would like personally. So you’ve pretty much pioneered the sound that you’ve built. Today if you’re starting off, there are a lot of dubstep artists that you could listen to. With that being said, when you started off, who were you listening to and what inspired you? What was happening in dubstep at the time was that Caspa and Rusko were the leading guys, really. In my music, I was trying to write Caspa & Rusko but I didn’t know how. I was inspired by their sounds, but no one was giving them to me. These days, you can get sample packs and be like “oh I want this sound” and you can pretty much download someone’s sound. When I started there wasn’t really any of that. If you wanted to sound like someone, you’d have to learn how they do it. With people like Rusko, such an original artist, there’s no way to go “oh, if I press that button, I’ve made a great song.” Maybe with new tech that would be possible, but in the creative process of trying to discover how to make dubstep that I really enjoyed listening to, I ended up discovering my own sound. I didn’t know how to do anything else, I had to invent my own way. No one really liked it for many years, and after a while people were like “oh wow this is great.” I’ve been making it for years when people were like “this… isn’t good. This isn’t really dubstep, we don’t really understand it.” We’d play shows and I’d do my thing and it took a few years for it to connect. At that point, I was solidified with the sound I really enjoyed writing, so I stopped trying to sound like everyone else. There was no instant moment when I had a song out and everyone was like “oh! He’s invented something new!” Over a number of years I kept doing it to a standard that became my sound. Now, when you look back at it, there’s a moment when I started doing something new. At the time, it didn’t go like that. There was no getting up in the morning thinking “I’m an innovator!” I don’t think you can innovate, I think you can be yourself. I think everyone is capable of doing something interesting for the world, but you have to let yourself be yourself to find that thing. To other people, that’s innovation. When you’re yourself, everybody else is like “how are you doing that?” And you’re like, “I don’t know, I’m just being myself basically.” Because of that, it seems like innovation, but I think it’s just being true to what you want to create. If you could say something to your 10-years-ago self, what would it be? Probably to trust myself with everything, really. With the creative process, it’s important to have people around you that you trust and can listen to, but I feel that part of growing up is to trust your own thoughts. You know that moment when you realize your parents don’t have the answers? You’re like, “Wait a second, I think my parents are wrong and I think I’m right! ?” That switch keeps happening to you as you grow up and I think that as an artist it’s the same. You listen to everyone else and you think, “Oh, everyone surely knows better than me.” As you get older, you realize that you’re yourself and that you need to make decisions for what you want to do. I don’t think I’d tell myself anything, really. I wouldn’t have gotten here, and I’m happy to be here, so I’m pretty stoked, really. On a more fun note, what’s the craziest thing you’ve seen in a crowd? So you are paying attention to the crowd while you’re performing and in the zone? I try to create a world where anything is possible, really. With my music, my set, and the whole world of Flux Pavilion, it’s about losing touch of reality and soaking up whatever the music is giving you. I get in a state like that myself when I’m being Flux Pavilion. Whenever something odd happens, it’s like, “Cool,” this is happening now. Nothing really strikes me as crazy because it’s all crazy and none of it’s crazy at the same time. What should we be expecting from your live show in London on October 13th? It’s actually the third one that we’ve done. I’ve always wanted to see how I could creatively and musically expand on the Flux Pavilion live experience. As a DJ, you can’t really improvise. You can in that you can say “I’ll play this song and then this one,” but you can’t creatively improvise within the songs. I’ve wanted to create a platform where I could mess around with all of the parts inside of the song and see if I could create or discover something new by performing it live, essentially. It’s a matter of trying to capture exactly what a Flux Pavilion set feels like, but with the capability of being able to expand on it and f**k around with it. How would you say that the crowds compare between US and UK shows? There’s no PLUR in the UK. I don’t think so, I haven’t come across it. There’s the whole kandi rave culture over here, and I feel like that’s something that happened in the nineties in the UK. As an artist from the UK touring over here, it feels like experiencing what the nineties might’ve been like in the UK, essentially. I think rave music has been happening over here, but it’s just recently blown up. I never got to experience it then, so I’m enjoying it now. You played at Moonrise Festival last year too, what made you decide to come back? It’s just a good festival. I’ve been doing shows with the guys who run it, Steez Promo, since what I think was the second festival I’d ever played in America, and that was at Starscape festival. It was me, Excision, Datsik, Doctor P, Skrillex, Noisia, Borgore, and just about everybody at the same stage. I was playing my set and all of those guys were behind me. It wasn’t even the lineup: yeah we were all playing, but everyone there was hanging out and having a great time. That must’ve been a few years ago now. I think it was about seven years ago. This [electronic music festivals] hadn’t happened at that point. Thinking back to that day, I’ll remember that show, Baltimore, and Steez as a really pivotal moment in this. We started thinking this is happening now. It was the biggest show I’d ever done in my life at that point. Steez, the people that run this [Moonrise], are a part of the framework of how everything has worked out. Final question: What should we be expecting from Circus Records in the near future? A selection of beauty. 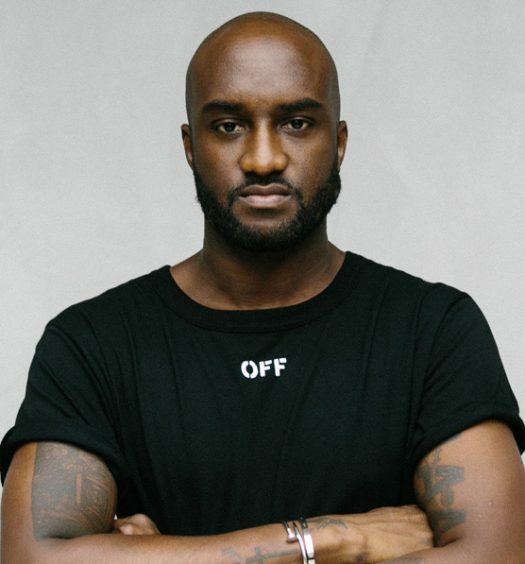 We’ve got a bunch of people that we’ve signed and we just had a release from Wooli, with more stuff coming from him. Craymack just put out a track called “Arrival,” which is one of my favorite tracks at the moment. There’s so much great stuff happening. The idea of Circus feels like it did when we first started: this exciting platform that we’ve created where artists can feel free to express their own sound. When everything blew up, we didn’t know where we fit in what was happening, but we’ve laid it out. We’ve pretty much spent the past couple of years figuring what Circus is all about. I feel like over the past six months it’s all clicked. We know what we’re doing, what we want to achieve, and where we’re going.